The “Malazan Book of the Fallen” is considered as the most dark fantasy by many, thats the one reason that I didn’t dumped it after reading Gardens of the Moon. I really want to know and explore the complex world that Erikson has created in this epic series or atleast get to know why it is tagged as the most dark fantasy. Even the most ardent fans of the series says that first book is the weakest and series really picks up after third book. So I’ve decided that I’m not dumping this series before readingMemories of Ice. 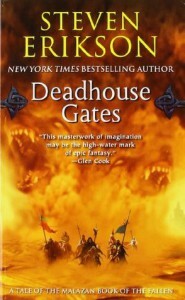 I must say Deadhouse Gates is much better than the Gardens of the Moon. This book has all the basic fantasy ingredients i.e. an epic journey, a dangerous rescue mission, an ongoing war, some prophecies and great action. This story has a whole new set of characters, only Crokus, Fiddler, Apasalar and Kalam are here from the first book. At the start I felt very frustrated with the introduction of this whole new cast which bears almost no connection to the previous book or its events. But slowly I got used to this new cast. 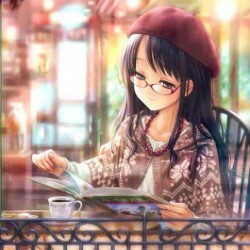 Story and writing is better than the first book. Dialogues are better. But at places I still struggled to get what is going on in characters head or what they’re planning. Thats one of the problem with huge casts and multiple POVs that they demand explanation and Mr Erikson is very stingy when it comes to explaining events or why his characters are like the way they are. Second thing that I hated about this book is Mr Erikson uses magic so heavily and he never cares to explain the magic system. There are different kind of warrens (magic system), but I never get what are the function of these warrens or which one is the strongest or weakest. How can anyone use magic anywhere? Third thing that annoyed me was the length of the book. it could have been some 200 pages shorter. Literally there were places where I so wanted to jump to last two chapters and get over with it. I don’t hate big books but reading some 800+ pages with so much confusion and without any explanation takes it toll. I’m still determined to read third but may be a month later. I really want some good books to read before I think I’ll be ready to read next book in this series.